This post is so that I can participate in this week's Flashback Friday. .... Last Summer I had a frame with 5 slots that needed filling (Rhona got it for me for Xmas a couple of years ago). My Mum decided to fill it with photos of me. She picked pictures where I particularly look like Aaron (or the other way around obviously). The top left picture is me and my Gran and the picture is taken in her sitting room in Ireland. I am the wee one sat at the piano. All the trophies and medals are for Irish Dancing/Irish Music, and were awarded to my Mum and her brothers/sisters (she is one of seven). 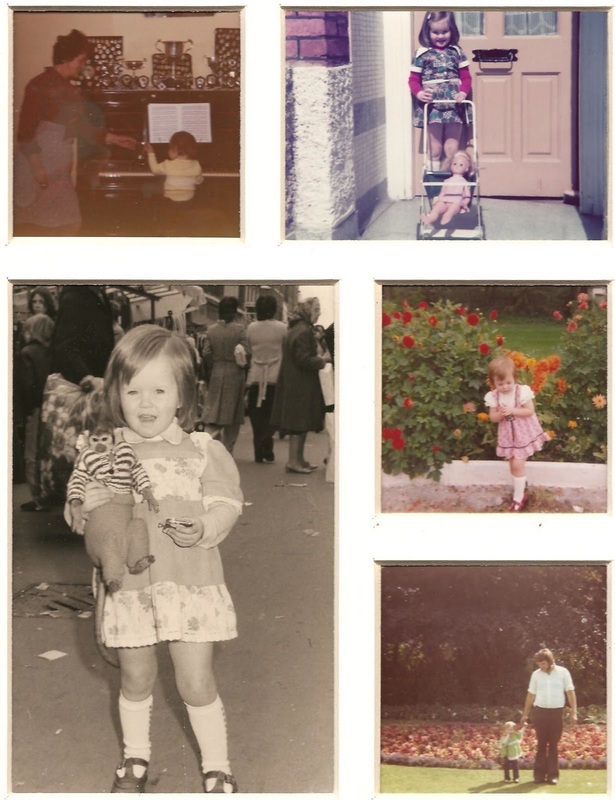 The bottom left is me carrying a live monkey (I don't know what they are called). It wouldn't be allowed nowadays AND I wouldn't have the guts nowadays. I am scared of anything that moves, that is small (apart from Aaron). Oh, and the photo is taken in Walthamstow Market. Bottom right is me and my Dad, which is special, as him and my Mum broke up when I was 8 years old. I know I have missed one out but it's self explanatory - me and flowers, but again it's in Ireland.